Today we’re happy to announce the Beta of a new Debugger Webhook. The webhook enables customers to receive an HTTP request from Twilio every time an application errors occurs. Customers can use this data in several interesting ways, including publishing it to industry standard monitoring services like New Relic or Rollbar. 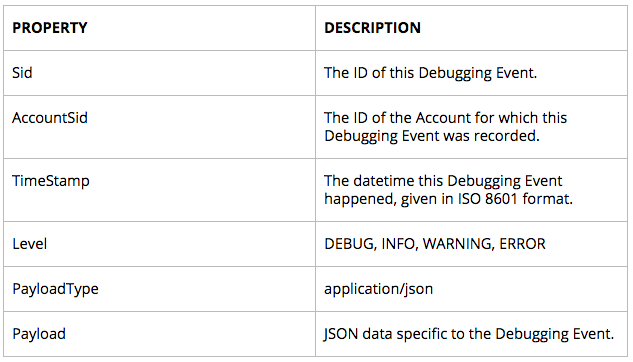 This past May at Signal we launched a brand-new Console Debugger for Twilio developers that helped them more quickly diagnose and resolve issues with their Twilio applications. The Debugger was integrated throughout the Console and provided customers with a high-level overview of error rates, as well as the ability to drill down into an individual error or category of errors. The feedback from customers has been very positive and Twilio has seen aggregate error rates decline significantly as customers are better able to troubleshoot their apps. However, we have heard from developers that they also want a programmatic way to get notified when errors take place in their Twilio-based apps. The method of doing this today involves continually polling the REST API which isn’t timely and it takes up more resources than necessary. Developers wanted a way for debugging events to get pushed to their software as they happened. Configuring the webhook is easy, just go the Debugger and click on Settings. We can then deploy this new code and configure the Debugger Webhook to point at the new endpoint. The next step would be to intentionally trigger an error on your Twilio account. An easy way to do this is to create an invalid TwiML Bin and wire it up to a phone number. As you can see, the information about the error including the log level and error code has been published to Rollbar. From here, it’s easy to use Rollbar to create a rich set of rules that govern notifications, including setting error and error rate thresholds, and firing pager alerts when appropriate. If you have any any questions about the Debugger Webhook don’t hesitate to reach out to me at @crtr0 on Twitter or carter@twilio.com.